Democratic Gov. 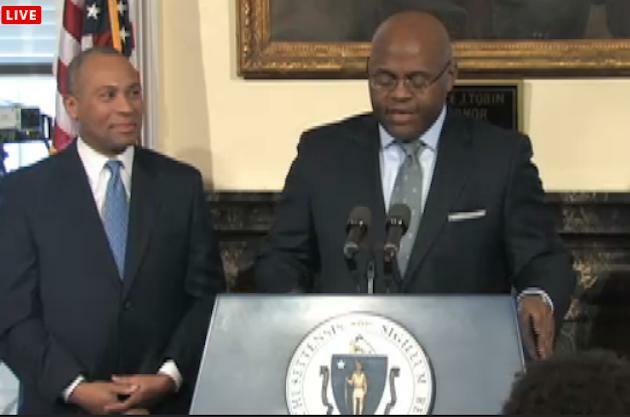 Deval Patrick on Wednesday appointed his former chief of staff, William "Mo" Cowan, to serve as interim U.S. senator for Massachusetts following John Kerry's confirmation Tuesday as secretary of state. "Mo Cowan has been a trusted adviser, and professional colleague and friend for a very long time," Patrick said at a press conference at the Statehouse Wednesday. He lauded Cowan's law background and experience in the administration, in which Cowan has served since 2009. Cowan, who will not be a candidate in the special election to succeed Kerry, reassured his new constituents that he will head to Washington "ever mindful of what matters to the people of Massachusetts." He noted jobs, education and affordable health care as top priorities for state voters. Massachusetts voters will head to the polls April 30 for the special primary election and June 25 for the special general election. Rep. Ed Markey has already announced his intention to campaign in the Democratic primary. He has drawn significant support for his bid, including endorsements from Kerry, Victoria Kennedy—wife of the late Sen. Edward Kennedy—and the Democratic Senatorial Campaign Committee, which steers Democratic Senate campaigns. But that solid backing may not be enough to head off a potentially bitter primary challenge. Markey's Democratic colleague, Rep. Stephen Lynch, is considering running and plans to make an announcement regarding his intentions Thursday. And Republicans are awaiting a decision from recently ousted senator Scott Brown, who won his seat in 2010 in a special election victory in the traditionally Democratic-leaning state. Brown lost re-election in 2012 to Democrat Elizabeth Warren, who became her state's senior senator on Tuesday just 26 days into her first term. Warren, in a statement Wednesday, offered her congratulations to Cowan: "I am very pleased to welcome Mo Cowan to the Senate. As former chief of staff to Governor Patrick, Mo brings a deep knowledge of the issues facing the people of our Commonwealth to the Senate. He will be a committed, hardworking interim Senator, and I look forward to working closely with him to protect the interests of Massachusetts families."